Includes all sessions on Saturday. The Friday Job & Language Fair is only open to NOTIS members. Includes choice of workshops throughout the day Saturday. Use this option if you do not plan to attend the Friday Job & Language Fair. Friday Language Fair and all sessions on Saturday. Includes choice of workshops on Saturday. In honor of International Translation Day, please join NOTIS for two days of translation and interpreting events. Don't miss this opportunity to meet your present and future colleagues and learn more about language careers! NOTIS members attend at reduced rates! Not a member? Join today! Language & Job Fair, Friday, Sept. 28 (2-5 p.m.): Free for members! Our second annual Language & Job Fair featuring more exhibitors than last year! Meet representatives from translation and interpreting agencies, other employers, educational organizations, and non-profits. Share your CV and learn about opportunities. You can even browse and buy books translated by your colleagues! 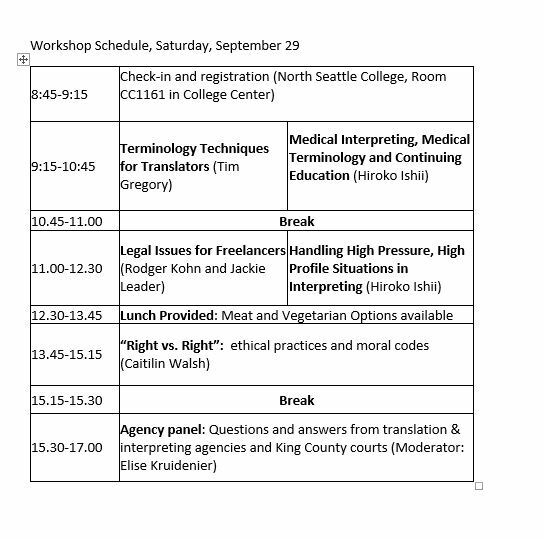 Workshops, Saturday, Sept. 29 (8:45 a.m-5 p.m.): Workshops for translators and interpreters on ethics, legal issues, terminology, technology, and more. The schedule below is subject to change - please check back for updates. NOTIS was recently informed that Esther Navarro-Hall, who was scheduled to present two sessions, is seriously ill and will not be able to attend this event. Please keep Esther and her family in your thoughts. The schedule above has been revised, with a new session by Hiroko Ishii added. Continuing education credits will be available for specific sessions on Saturday, pending approval, from ATA, WA AOC, OJD, DSHS, CA CIMCE and ID AOC. To earn your credits, you must sign in at the beginning of your session and stay until the end. We cannot make exceptions to this rule! Last day to register: September 27th.